Gratitude is the lubricant that helps you keep your goals. It’s future looking and healing. When we live in the now with an eye to the future it’s easier to make choices that support achievement of our goals. Gratitude is a muscle. The stronger it is, the easier it is to achieve, which builds confidence, success and a positive cycle. Let’s work on building our gratitude muscle. 1.Measure gratitude – Because gratitude is intangible, how do we really know if we are improving on building gratitude? The assessment is one way for individuals, their teams, and businesses to engage in gratitude. From this assessment comes tangible measurements of the seemingly intangible quality of gratitude. Look for future free webinars on the Gratitude Assessment which is in the book. 2.Create a plan – From the measurements, we can create a plan and practice to improve gratitude. 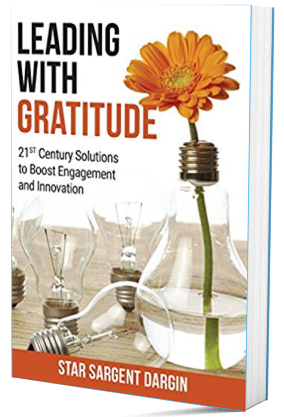 For teams and organizations, this may involve reviewing and integrating elements of gratitude into people, technology, and processes. What training is needed and what is the desired culture? 3.Practice Daily–It is recommended at least 10 minutes a day of gratitude will improve your day. See our checklist for ideas of how to create your own practice. 4.Reassess Gratitude – Revise your plan every 30 days, every 6 months, annually and update as needed. Gratitude builds a muscle that, when strong, allows the hardest of realities to be dealt with in a positive way. When undertaking new goals and transformation is not a linear path. Gratitude helps with dealing with and moving through setbacks and hard realities. We must be able to overcome and get through the difficulties and awkwardness of doing something new. Gratitude is contagious! When you build your gratitude muscle it can help others. Learn how by downloading our checklist, buying the book, or taking the course. What do you think? What’s your gratitude plan look like?